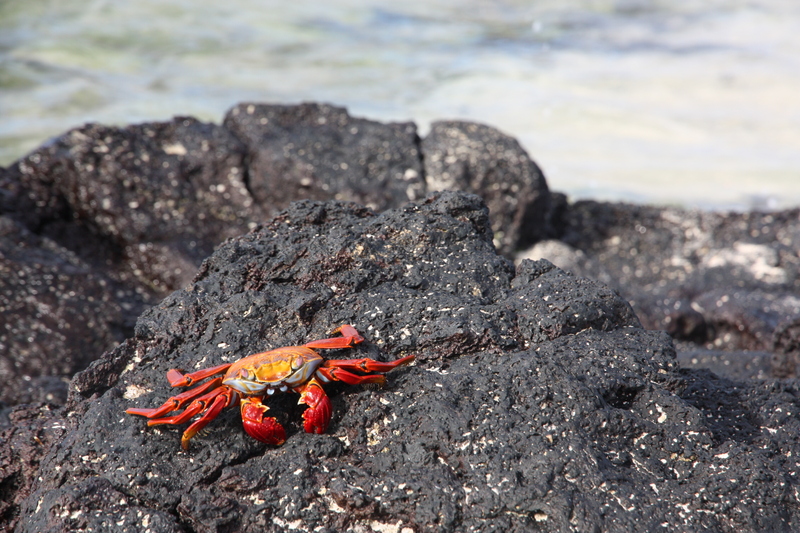 Being crabby in the Galapagos | Where to next? 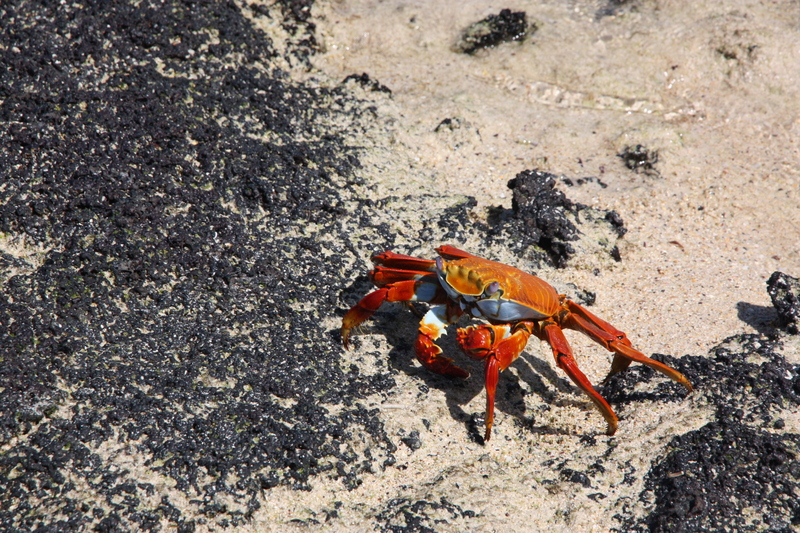 The Galapagos Islands have hundreds, no thousands, no millions of crabs. And there are just two main kinds—Sally Lightfoots and fiddler crabs. There must be other types, but we didn’t see any. 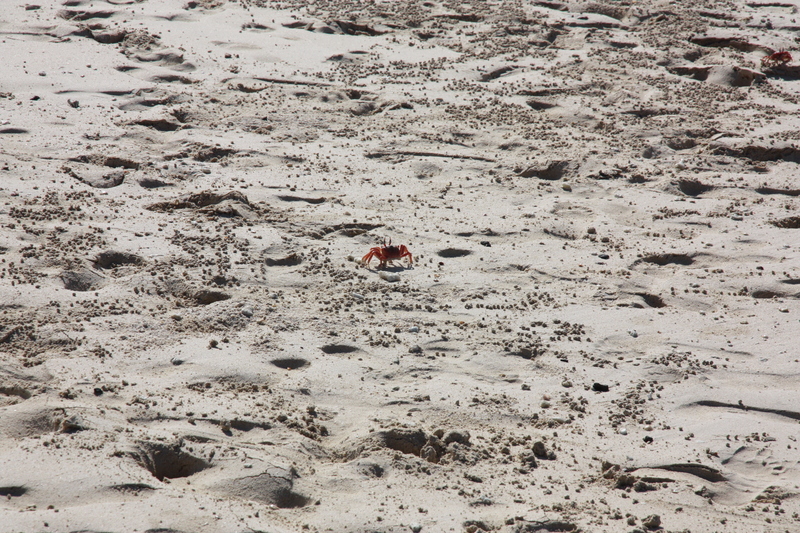 Sally Lightfoots (Grapsus grapsus) are also known as red rock crabs. They are usually 3–5 inches across, and are common along the Pacific coastline from Mexico to northern Peru. In the Galapagos, and probably elsewhere, they live mostly on the lava rocks, just above the sea spray line. You see them everywhere, and usually hanging with the marine iguanas and sometimes the sea lions. They’re cute, colourful and fast. It’s their colour that catches your eye first. As babies they are black so they blend into the lava rock, making them invisible to their predators such as herons. But as they age, they become bright red, often with spots of pink and yellow. Our guide, Rodrigo, explained that red signals poison in the animal kingdom, so Sally Lightfoots are well protected as adults. Ah, except from fishermen who like to use them as bait. But first they’ll have to catch them. These little buggers are fast and agile. They are flat and close to the ground. Their five sets of legs let them scamper and jump across rocks. They can climb vertically and seem to be able to walk on water. It’s not easy to get a close-up photo either. As soon as you approach, they vanish under the rocks. So it pays to stand or sit motionlessly until they reappear, but even then lifting your camera sends them scurrying. Fiddler crabs—only about an inch or two across—are equally fast. They spend their days on the sand, and as you approach any beach you see battalions of them dash for the protection of their recently-dug burrows. According to Rodrigo, a fiddler crab spends the night above the tide line. Each morning they dig new burrows. The digging is part of feeding. The crab lifts the sediment to its mouth to sift through it for food. After everything edible is taken—such as algae, microbes, fungus or other decayed matter—the remaining sediment is discarded in the form of a small ball. Sediment balls radiating out from a burrow’s entrance indicate that a fiddler crab is in residence. But just looking at the movement on the beach is enough to show you the sand is alive with fiddlers. By the way, the name fiddler comes from the crab’s asymmetrical claws. The movement of the smaller claw from ground to mouth during feeding makes it look as if the animal is playing the larger claw like a fiddle. 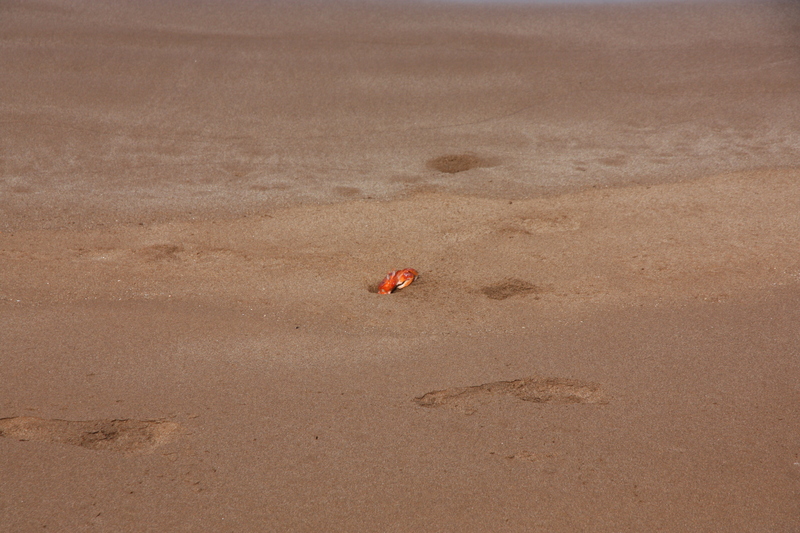 I spent a lot of time stalking crabs. I stood as still as possible until they would re-emerge from under rocks or burrows, but they always had their little eye stalks pointed my direction. So I only got shots from a distance. Next time I’ll take a tripod, a remote shutter release and a triple dose of patience.